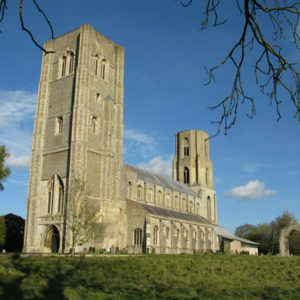 Our next concert in Ely will be ‘A Night at the Opera’ in the Hayward Theatre, King’s Ely, The Gallery, Ely CB7 4EW. Tickets will be on sale from 3rd June 2019 at Burrows Bookshop, 7, High Street Passage, Ely, Tel 01353 669759 or tickets@elychoralsociety.org or at the door on the night. 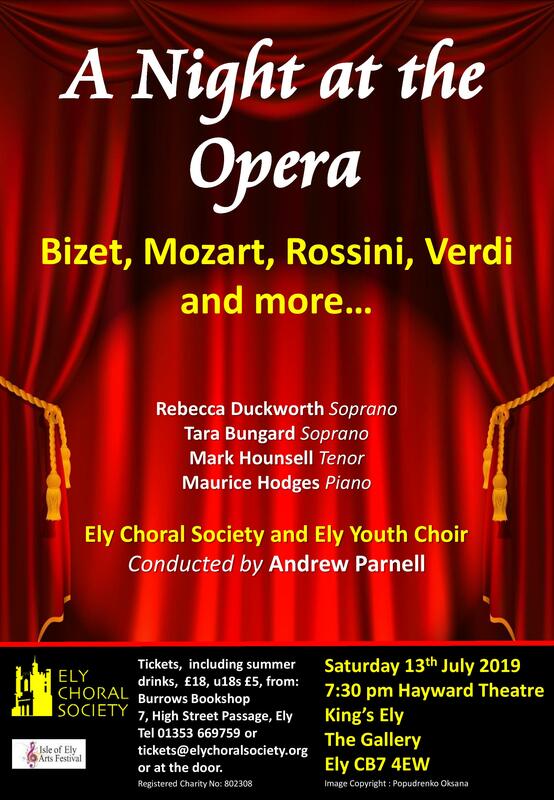 The final concert of 2019 Isle of Ely Arts Festival will be a sparkling evening of great music from the operatic stage – choruses, arias and ensembles by Bizet, Borodin, Mascagni, Mozart, Rossini and Verdi sung by Ely Choral Society and Ely Youth Choir. The concert will be conducted by Andrew Parnell. Tickets, including summer drinks, £18, u18s £5 will be on sale from 3rd June 2019 from Burrows Bookshop. 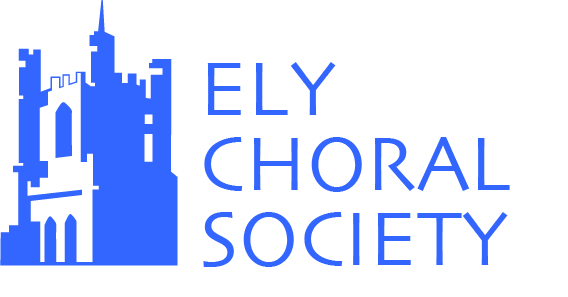 Ely Choral Society reached new heights in their performance of Elgar’s ‘The Music Makers’ in their concert in Ely Cathedral on Saturday 13th April 2019. They showed an affinity for the composer, and under the baton of Andrew Parnell, soloist, choir and orchestra gelled as one, expressing the fundamental feelings and spirit of the words of the poet A. O’Shaughnessy. ‘We are the music makers and we are the dreamers of dreams’ was the recurring theme and in very soft, calm moments these performers expressed exactly the magical ethereal mystery of the words. This same enchanting sensitivity was apparent in ‘Qui Sedes ad dexteram Patris’, the sixth movement of Poulenc’s ‘Gloria’. There were also some lovely moments in the other work in the programme: Brahms’s ‘Rhapsodie’, especially when the lower voices of the choir joined the soloist in expressing the poignancy and sense of longing so typical of Brahms’s style. . The whole concert was well worth a visit and featured worthy soloists: Elenor Bowers-Jolley soprano and Stephanie Windsor-Lewis mezzo-soprano and a fine orchestra: the Medlock Ensemble. The next event for Ely Choral Society in Ely will be on Saturday 13th July at 7.30 p.m. in the Hayward Theatre: ‘A Night at the Opera’.